Prior to 1890, France, still Britain’s main naval rival at that point, paused its battleship construction because of the influence of the Jeune Ecole doctrine. The latter blindly and radically favoured torpedo boats and torpedo-carrying ships in general, at the expense of traditional Battleships. After the Ironclads era of the 1860s (Gloire, the famous precursor, followed by the Couronne, Magenta, Provence and Gauloise classes) the 1870s saw transition to central battery ships with barbettes (Ocean, Colbert, Devastation classes and Friedland, Richelieu, Redoutable, Alma and La Galissionnière classes), then came the barbettes ships of the 1880s: The single Amiral Duperré (1879) and Hoche (1886), Amiral Baudin & Marceau classes and their “coast guard” equivalents, the Bayard and Vauban classes. With one exception, Marceau (1887), they were all scrapped before WW1 began. 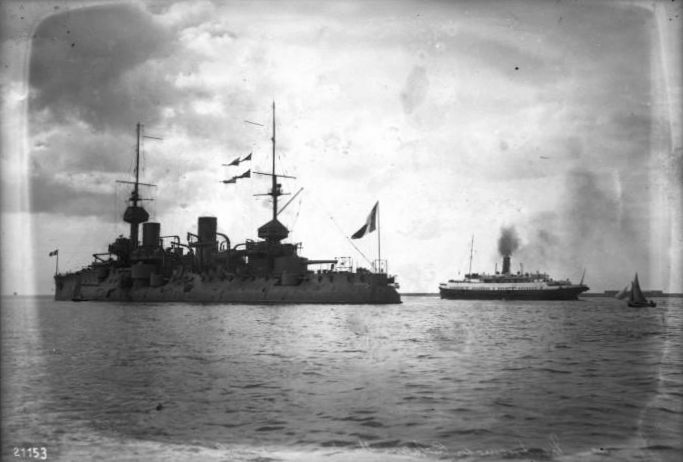 Noxious Jeune Ecole‘s influence gradually faded, but nonetheless the 1890s French battleships (starting with Brennus, in 1889) were known for their individual ships as opposed to the homogeneous classes in the Royal Navy. Their arrangement of heavy guns was also unusual, with single barbettes/turrets of larger caliber 13.4-inch (340 mm) for example rather than 12-inch (305 mm) and later two 12-inch and two 10.8-inch, still in single turrets arranged in a lozenge. 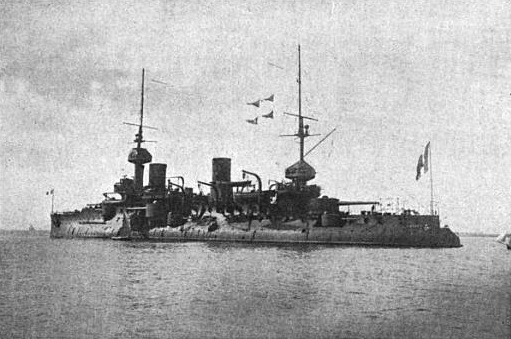 The Charlemagne class however (1894–1896) were the first to standardize four 12-inch (305 mm) in two turrets and put real efforts for the first time in standardization. Jaureguiberry and other reserve same class Sqn Mediterranean battleships, Carnot, Masséna and Bouvet. 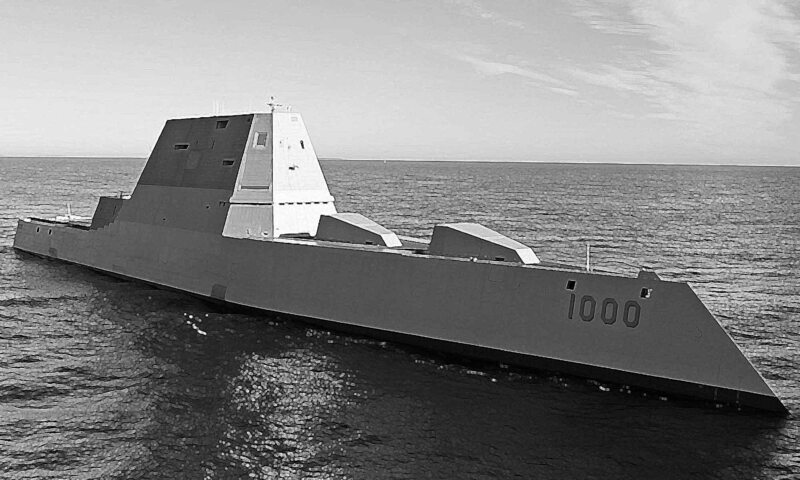 This program emerged for a response to the British Royal Sovereign class, and comprised a “prototype”, the Brennus, followed by a class with the same specifications, using, according to the Young School theory, the same blueprints with a lozenge-arrangement and various specifications, Charles Martel displacing 11,693 tons, Carnot (1894) 11,954 tons, Jauréguiberry (1893) 11,637 tons, Masséna (1895) 11,735 tons and the heaviest, Bouvet (1896) 12,007 tons. These ships never left their mark in French design in positive ways. Contrary to British yards, French relative inefficiency ensured they were commissioned long after being laid down, and therefore already obsolescent in 1900. Their mixed main artillery was noted for a relatively higher rate of fire and range, a distribution that allowed three guns in pursuit and retreat which was better than the Brennus. However the side sponsons 10.8-inch guns (to save weight and improve stability) lacked hitting power, barely compensated by the advantage of a gun. Plus, with six different calibers, ammo management was nightmarish. There were some quality construction issues also like the welded tubes for Lagrafel d’Allest boilers on Jauréguiberry, perhaps the unluckiest French battleship in history. 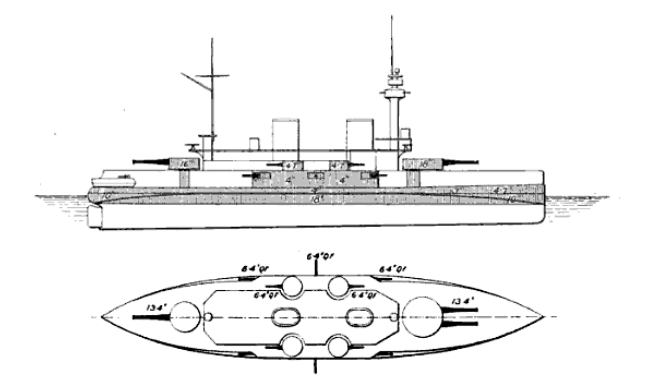 The tumblehome presented well-known advantages of a sloped armour over standard flat armour, and was supposed to help stability, however these generations of ships had limited or absent compartmentalization in case of underwater hit. The Bouvet made this dreadful experience when hitting a single mine in the Dardanelles, which was fatal. This was a 176-pound (80 kg) explosive charge and the ship capsized and sank in two minutes, which left little chance to the crew, carrying with her 660 of 710 men. There is some confusion about another Charles Martel class, barbette ships 10,600–10,650 tons, which were basically slightly enlarged Marceau types designed by Admiral Aube. The class comprised the Charles Martel, laid down 1883, but construction was suspended 1886 just like the Brennus laid down 1884, but and construction suspended the same year, in the same yards. The the next same namesake were built at their place, hence the origin of the confusion. Battleship Charles Martel, colorized photo by Hirootoko jr. 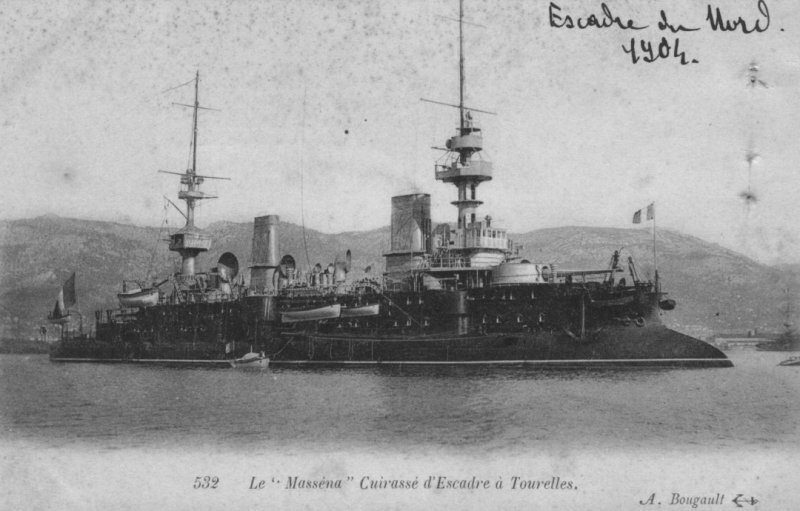 But the situation was dire at the end of the 1890s: The Jeune Ecole retained a strong influence and had many partisans in French naval staff deciding of strategy, and government walz, frequent budget revisions, largely inefficient yards with sometimes ten years of contruction, bureaucratic meddling and corruption made the price of the battleships soar. By all means, France had abandoned competition with Britain in battleship numbers, and consequently suffered the most from the dreadnought revolution, accusing a five years gap in construction in that area when the great war broke out. It was fortunate in a sense that her main fleet actions were confined to the Mediterranean, because she was no match for the Kaiser’s Hochseeflotte, having no battlecruisers, a collection of obsolete pre-dreadnoughts, equally obsolete cruisers, a large fleet of torpedo boats confined to coastal waters and small, short range destroyers, unfit to serve in the Atlantic. She could be summup as the first with modern Belleville watertube boilers. She was the first “turret ship” after the long list of barbettes pre-dreadnoughts of the 1880s, of which none was operational when WW1 broke out. The Brennus was launched in October 1891, well before than the Charles Martel (August 1893) but like Jaureguiberry (October 1893). She was laid down on 12 January 1889 at Lorient dockyard. The name came from a title given to at least two famous Gallic Chieftains, the first sacked Rome in 380 BC and the other Delphi (Greece) in 279 BC. Rampant Nationalism of that era made adoption of these a fitting response to German nationalism, it was not long after a statue of Vercingetorix war erected, facing Arminius on the other side of the Rhine. To add some confusion, another Brennus was previously registered, a design by Admiral Théophile Aube and improved Marceau, this first Charles Martel class was cancelled after he passed out. This first ship was laid down in 1884 at the same Lorient yard, but the blueprints were completely redrawn and the keel was laid down a second time four years later. 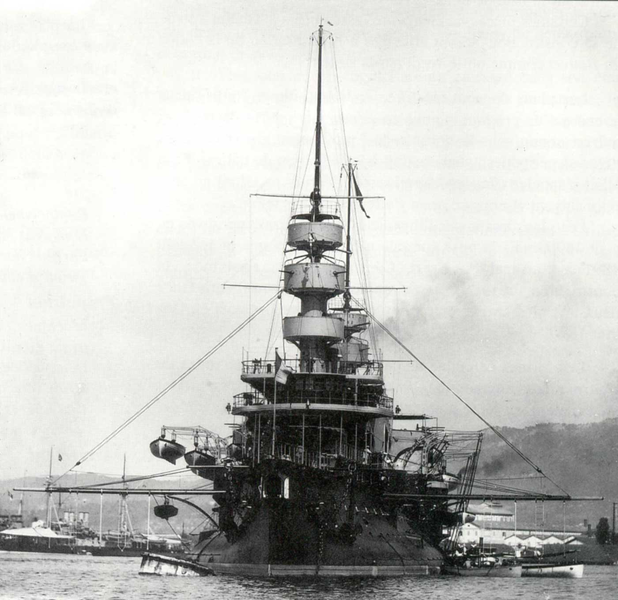 The Brennus innovated at least in two ways: She was the first French turret battleship (no more barbettes), also the first to use model Belleville watertube boilers, and the first with twin turrets. It looked like at least France went on the right path, but in fact if this precursor led to a more or less homogeneous class of five battleships, they all reverted to the of Lozenge-type artillery configuration in single turrets with unequal caliber. The Charles Martel was the first of the heterogeneous “class” of five battleships built to a broadly similar design. All differed enough to be considered unique, all had similar Design specifications but different engineers, yards, and lack of overall control were responsible for this diversity. The Martel, like the four others was based on the previous Brennus, but crucially, used the famous French lozenge arrangement seen already on the older Magenta. Main battery guns were therefore separeated in individual, smaller and lighter turrets moved on the wings. And these ships were supposed to answer the British Royal Sovereign-class battleships. In the design, aspects also of the older Marceau-class designed by admiral Aube were took, but after his departure, plans were redrawn. The Charles Martel was 115.49 meters (378 ft 11 in) long band displaced 11,639 tonnes (11,455 long tons), with a pronounced tumblehome and long forecastle giving her a high freeboard forward, but lower aft. Her heavy military masts were used for optics and small guns. Her crew comprised 644 officers and enlisted men, part of which served two vertical triple expansion engines fed by the steam supplied by twenty-four Lagrafel d’Allest water-tube boilers. This powerplant gave 14,900 designed horsepower (11,100 kW), giving 18 knots (33 km/h; 21 mph) and she carried 650 t (640 long tons; 720 short tons) of coal, and up to 980 tons in wartime. Her armament comprised Charles two Canon de 305 mm Modèle 1887 guns in single fore and aft turrets and two Canon de 274 mm Modèle 1887 in wings single turrets on sponsons over the tumblehome. Secondary armament comprised eight 138.6 mm Modèle 1888 guns, in single turrets, at the superstructure corners, four 65 mm (2.6 in) QF guns , twelve 3-pounders, eight 1-pounder revolver guns in the superstructure and masts. For close quarter she also had two 450 mm (18 in) submerged side torpedo tubes. Armor comprised nickel steel plates, 460 mm (18 in) on the belt, down to 250 mm (9.8 in) on a lower level and reduced both sides of the central citadel to 305 mm (12.0 in) down 250 mm (lower edge). Above the belt, sides were 101 mm (4.0 in) thick. The main turrets fore and aft and in sponsons were 380 mm (15 in) while the corner ones, secondary turrets were 101 mm thick. The main deck was 69 mm (2.7 in) thick and the conning tower had 230 mm (9.1 in) walls. 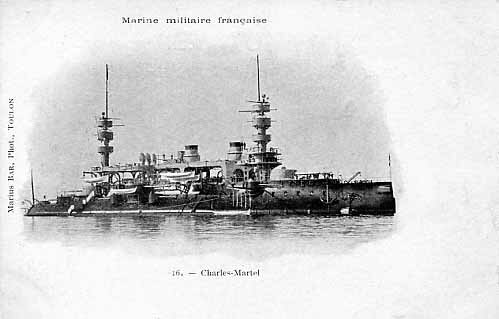 The Charles Martel was completed and commissioned in June 1897. Her boiler tubes were replaced with safer models in mid-sea trials (a consequence of Jauréguiberry’s accident with welded tubes boilers). She joined the Mediterranean Squadron, became the flagship of Rear Admiral Roustan (Second Division). She made a large scale exercize with the Northern Squadron in June–July 1900, and a Grand presidential Review in Cherbourg in the fall of July. She reached the press in the 1901 maneuvers, after which having being mocked-torpedoed by submarine Gustave Zédé. In 1902, she joined the Reserve Squadron, and missed the annual fleet maneuvers of the next summer. The reserve was renamed Second Squadron in 1906, the Second Division under the command of Rear Admiral Germinet. This was a state of reduced readiness with minimal crew and full commission for three months yearly, until 1914. By that time, she had been laid up in Brest along with Carnot. She saw little service, maintained onlyas a stopgap until the completion of the Normandie-class battleships, but she was stricken in 1922 and sold for scrap. She was ordered on 8 April 1891, laid down at Forges et Chantiers de la Méditerranée, La Seyne-sur-Mer in November 1891, launched on 27 October 1893 and Completed 30 January 1897, and Commissioned 16 February 1897 at a global cost of 23,385,000 F. She was generall similar to the Charles Martel, with its pear-shaped sections (important tumblehome) and the turrets uncomfortably close to the extremities. The Jaureguiberry was 111.9 metres (367 ft 2 in) long overall, 23 metres (75 ft 6 in) wide for a 8.45 metres (27 ft 9 in) draught and 11,818 tonnes up to 12,229 tonnes (12,040 long tons) fully loaded displacement. Her captain described her as an excellent sea-boat, stable and well laid-out but with a weak secondary armament. Battleship Jauréguiberry, named after XIXth century admiral and statesman Bernard Jauréguiberry. She had vertical triple expansion steam engines also from Forges et Chantiers de la Méditerranée which developed 14,441 indicated horsepower (10,769 kW) for 17.71 knots (32.80 km/h; 20.38 mph). However their twenty-four Lagraffel d’Allest had famously welded water-tube boilers working at 15 kg/cm2 (1,471 kPa; 213 psi) which proved troublesome to say the least. She carried 750 tonnes of coal in peacetime and up to 1,080 tonnes in times of war for a 3,920 nautical miles radius at 10 knots. Jauréguiberry armament comprisedtwo 305-millimetre fore and aft (arc of fire of 250°, depression −5° +15°). They fired a 340 kg (750 lb) shell at 1 rpm at 780 mps (2,600 ft/s), on a 12,000 m (13,000 yd) range. Her sponson guns were also 274-millimetre (10.8 in) Canon de 274 mm models and thirdly she had 45-calibre 138 mm Canon de 138.6 mm mounted in manually operated twin turrets at the corners of the superstructure (160° arc of fire, 4rpm, -10° +25° depression/elevation, firing 36.5 kg (80 lb) AP shells at 725 mps (2,380 ft/s) and 15,000 m (16,000 yd) range. Her light armament comprised, according to various srources, four 50 cal. 65-mm (2.6 in) guns firing 4.1-kg (9.0 lb) shells at 715 mps (2,350 ft/s), about 13-18 QF 3-pounder Hotchkiss 47 mm (1.9 in) 40-cal Modèle 1885 mounted in the fighting tops and superstructure, firing a 1.49-kg shell at 610 mps (2,000 ft/s) and 4,000 m (4,400 yd) and 7-14 rpm. 8x 37 mm (1.5 in) Hotchkiss 5-barrel revolver guns mounted on the fore and aft of the superstructures, with a 1.1 lb (0.50 kg) shells fired at 2,000 ft/s (610 m/s) at 30 rpm but a range of 3,500 yards (3,200 m). The original planned six 450- mm (17.7 in) torpedo tubes initially fitted above water, bow, stern and broadside underwater. After the 1906 refit only the latter were kept. The armour scheme was about the same as with the Charles Martel, representing 3,960 tonnes (3,897 long tons) of nickel steel armour, 33.5% of her displacement. 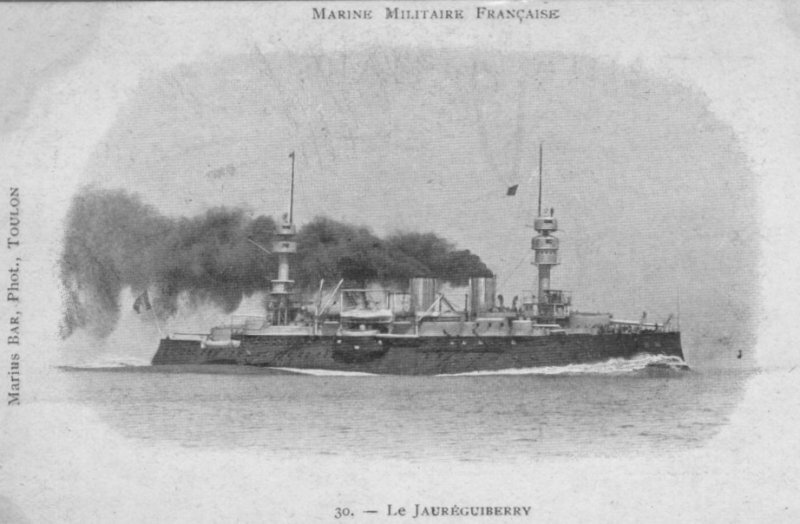 The Jauréguiberry sufferred two accidents in her early life: A welded boiler tube exploded burst on 10 June 1896 during sea trials, killing six and wounding three. She suffered another accident during firing trials and after commission in 1897, suffered a torpedo’s air chamber explosion on 30 March. She was only sent in May 1897 in the Mediterranean, but this was not yet finished: On 20 January 1902 the air chamber of another torpedo exploded. She was transferred to the Northern Squadron in 1904, and struck a reef off Brest in the fog on 18 July 1904. Repaired, she returned in the drydock following her propellers damage and steering compartment flood caused by torpedo air flask burst during an exercize in 1905. While visiting Portsmouth (14 August 1905) she ran aground in the outer harbour. She was sent to the Mediterranean in February 1907 for the reserve, then third division in 1908. Two years later she was sent in the new reformed 2nd Independent Squadron to the Atlantic. When the war broke out she has joined the Training Division as flagship. Battleship Jauréguiberry during the war in 1915, in grey livery. Imperial War Museum collection. She escorted troop convoys between North Africa and France for some time, and also a convoy of Indian troops in the fall of 1914. Stationed at Bizerte until February 1915 she joined Port Said as flagship of the Syrian Division and departed on 25 March for the Dardanelles, replacing the Suffren and Bouvet. She became flagship of Admiral Guépratte from then on, covering operations and especially landings on 25 April and until 26 May, lightly damaged by Turkish artillery twice. She sailed back to Port Said on 19 July , shelling Haifa on 13 August, participated in the occupation of Rouad Island on 1 September and eventually transferred to Ismailia in January 1916 for the defense of the Suez Canal. She was refitted at Malta and on 26 December 1916 returned to Port Said. After some of her guns were landed to defend the Canal in 1917 she went into reserved in 1918 and joined Toulon in March 1919, decommissioned, and became Engineer’s Training Schoolship and later an accommodation hulk, stricken on 20 June 1920, but still part of the Engineer’s School until 1932, and sold for scrap on 23 June 1934. Carnot was the second in the line of five battleships derived from the Charles Martel, which formed the basis for Carnot and three other ships with identical specifications, but different engineers design. She was 114 meters (374 ft 0 in) long, 21.4 m (70 ft 3 in) for a displacement of 11,954 tonnes (11,765 long tons) but her superstructure were cut down to save weight contrary to other ships, in order to reclaim stability. She was propelled by two vertical triple expansion engines fed by twenty-four Lagrafel d’Allest water-tube boilers rated at 16,300 indicated horsepower for 17.8 knots. As customary the main single-piece turrets were placed for and aft near the ends and the secondary main turrets on side sponsons, making a lozenge arrangement and pronounced tumblehome. The light secondary armament was placed also in sponsons turrets, on the four corners. The lighter armement was placed in the military masts and superstructure, about four 65 mm (2.6 in) QF guns, twelve 3-pdr (37 mm), eight 1-pdr revolvers (20 mm). She was also given two 450 mm (18 in) submerged torpedo tubes. The armour ranged from 460 mm (18 in) for the belt, 230 mm (9.1 in) for the conning tower walls and 380 mm (15 in) for the turrets. The Carnot, named after Marie François Sadi Carnot, French president elected in 1887 and assassinated by an anarchist when the ship was in construction, was launched at the Toulon NyD in July 1894 and completed and later commissioned in July 1897. By that time, personal and doctrine already started to change and the ship was obsolescent. The Carnot alternated between the Northern and Mediterranean Squadrons. In January 1900 she was transferred to the Northern Squadron (Vice Admiral Ménard) to replacing the Charlemagne, conducting annual training exercises and in 1901 joined the Mediterranean Squadron for combined fleet maneuvers. But she was soon transferred to the Reserve Squadron (Rear Admiral Besson). Her sister ships there were the same generation Charles Martel, Brennus (flagship), and Hoche. New large scale manoeuvers took place in the summer. 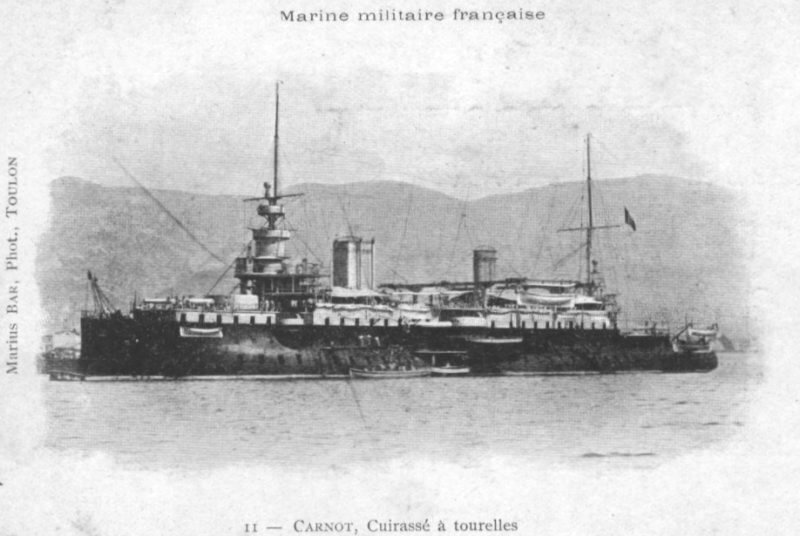 In 1906 Carnot returned to the Northern Squadron for the summer maneuvers and in 1907 she was back the Mediterranean Second Squadron, until 1909. She returned to the Northern sqn and was laid up for overhaul at Brest when the war broke out. She was kept on the effective list only waiting for the completion of the Normandie-class battleships, and stayed inactive for the duration of the Great war, before being stricken in 1922 and sold for scrap. Masséna proceeded from the same basic design but exceeded her design limits especially with weight and consequently suffered serious stability problems. This translated into sever roll and inaccurate firing, and was considered the last unsuccessful design of the serie. She served as the others in the Northern and Mediterranean Squadrons but was withdrawn from service just before World War I. Hulked at Toulon in 1915 she was later towed to Cape Helles on 9 November 1915 and scuttled as a a breakwater to allow less rough sears for the Allied expeditionary force re-boarding and evacuating at the end of the Gallipoli Campaign. 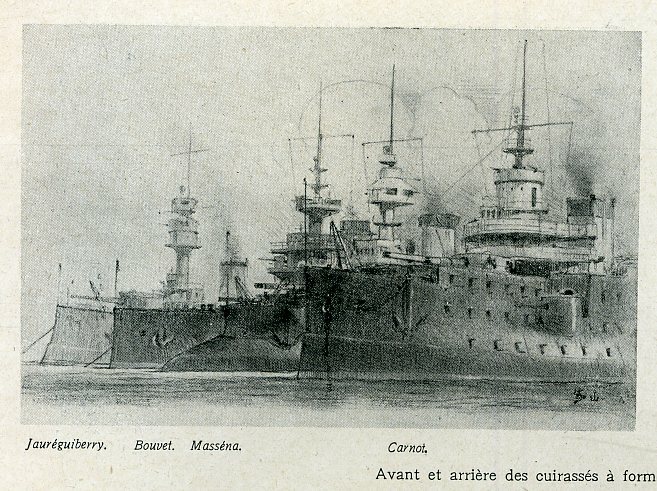 In terms of general design, the Masséna was roughly identical to the other ships, but significantly overweight when completed at Ateliers et Chantiers de la Loire displacing 11,735 tonnes (11,550 long tons), sitting lower in the water which left her armored belt partially submerged. She also had a pronounced snout bow to improve her buoyancy and was about the slowest of these at 17 knots (31 km/h; 20 mph) for 13,400 indicated horsepower. Her primary and secondary main armament ws the same as the others, but she carried eight 100 mm (3.9 in) QF guns, twelve 3-pdr QF plus eight 1-pdr guns and four 450 mm (18 in) torpedo tubes submerged. Aprt her come-and-back betwen the Mediterranean and Atlantic since her commission in 1898, nothing notable happened. In 1900 however four engineering officers were seriously injured while disassembling too quickly a pipe to repair it. 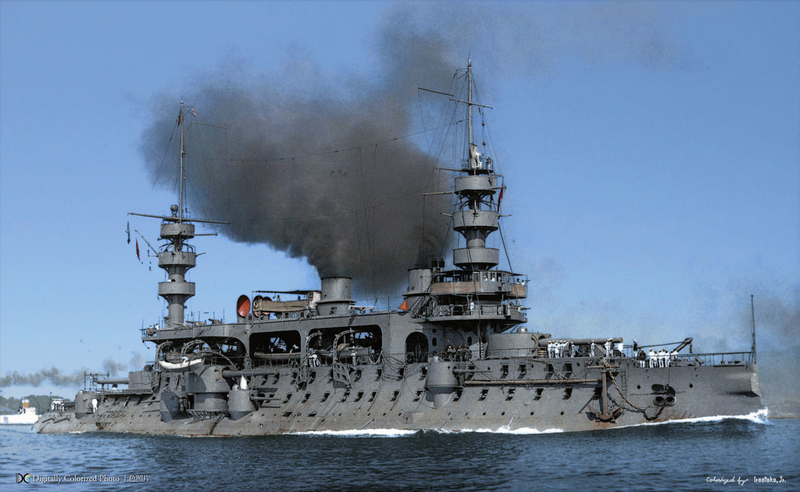 In 1902 Masséna participated in gunnery trials with the Suffren off Île Longue, Brest (Britanny, NW France). She fired at 100 metres (330 ft) on a 55 centimetres (21.7 in) thick armour plate placed on the Suffren’s turret, which was cracked at the fourth and fifth hits, but the turret was still fully operational despite the concussion. However two spinter flew away back, one hitting the Masséna above her armor belt and another near-missed Naval Minister, Camille Pelletan which came as an observer. Masséna went into reserve squadron from 1908, meaning a “semi-active service” until 1914. Too old to participate to the operations, at least her hull found some use at Galipolli. She is still there, off Sedd-al Bahr, Turkey, near the Aegean islands. Launched in 27 April 1896 in Lorient, Britanny and Commissioned in June 1898 she was the last and arguably most famous of the class of five battleships described here. She distinguished herself in the Dardanelles, but also was sunk in a particularly fast and spectacular manner, in an age where underwater compartimentation was not that paramount. For specifications see the table below. 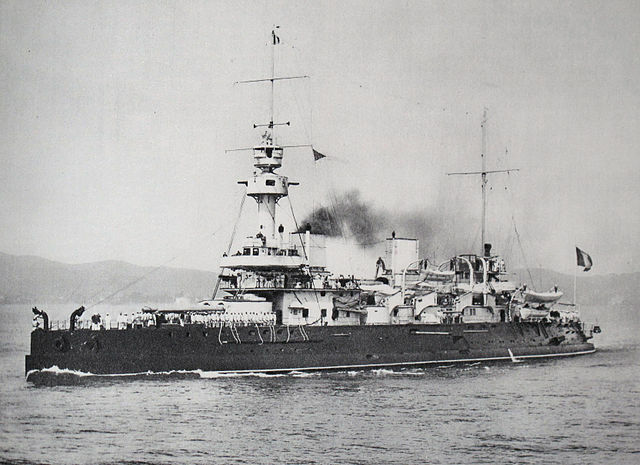 Bouvet (named after François Joseph Bouvet, a French admiral, which served in the East Indies under Suffren in the famous campaign of 1781–83) started by being replaced by battleship Suffren in the Mediterranbean squadronand replaced in turn the old Dévastation of the Northern Squadron (which went into retirement). During the summer fleet maneuvers 1903, as Admiral Gervais’s flagship, she was an observer in the simulated battles. However off Golfe-Juan, she was rammed accidentaly by the Gaulois on 31 January 1903, but both ships only took light damages. In1906 in the Mediterranean she passed under command of Vice Admiral Touchard and assisted populations in the Mount Vesuvius eruption in Naples in April 1906, with Iéna and Gaulois. In the following summer manoeuver, she nearly missed battleship Gaulois again. In Second Squadron by 1908 (reserved) she served with a reduced crew. When the war broke out, Bouvet escorted Allied troop convoys in and out of Africa until November and then scrambled to the Dardanelles. She was to catch the German battlecruiser SMS Goeben emerging from Dar-Es-Salaam but missed her. Admiral Souchon succesfully joined the Turkish fleet. 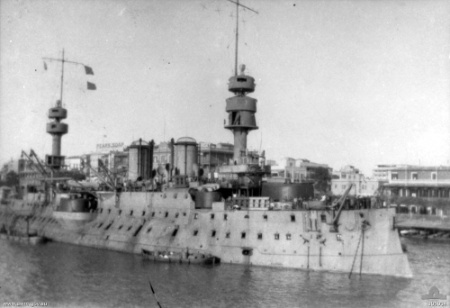 She shelled the Turkish fort of Kum Kale on 19 February and assisted battleship Suffren own fire by providing firing corrections by radio. Meanwhile Gaulois was teamworking by provided an efficient counter-battery fire against threatening coastal batteries. On March, 19, Bouvet, Charlemagne, Suffren, and Gaulois under command of Admiral Émile Guépratte started the Dardanelles campaign‘s main attack series over the Turkish fortresses, with a preparation of six British pre-dreadnoughts at longer range, the French would “finish the job” at close range. This force which recalled the “days of the Crimean campaign” was under overall command of Rear Admiral John de Robeck, under orders of Admiral Sackville Carden. The ships were aligned abreast in three rows and Bouvet was in the center, second row when she entered the straits at 11:30. Soon Çanakkale was shelled, then the fire turned to the Fortress Hamidieh and secondary fortifications until 13:30. Forts were pummelled then gun batteries were dealt of individually, with guided fire. But the Turks did not remained impassible. One fort after many near-misses hit the Bouvet eight times, badly comndemning her forward turret (propellant gas extractor broken, crew evacuated). A military masts was also cut down. This was when retiring at about 15:15, that Bouvet famously struck a mine (laid previously in secret by the Nusret) and its 176-pound (80 kg) explosive charge blew just below the starboard 274 mm gun turret creating a massive beech in which water poured in, making the ship capsize and sink on this 18 March 1915, in the matter of minutes and with a great loss of life. Authors lenghtly debated over the circumstances of the event later. The fact that the area was supposed cleaned previously by minesweepere, the presence of mines came as a schock. But the Nusret apparently went all lights shut down, using the cover of the dark at the foot of the cliffs to do its job. This was a feat in itself, but a discreet allied picket submarine could have spotted her without exposing too much of her to Turkish fire. In any case, Nusret’s crew became war heroes. The little converted ship indeed not only got Bouvet, but also Ocean and Irresistible and badly damaged the battlecruiser Inflexible. The fact Bouvet capsized and sank so rapidly could be explained by its poor condition after so many years of service at the time (and the absence of efficient submarine compartimentation, lessons learned in 1905 with the Russo-Japanese conflict) and some speculated that her nearby sponson turret ammunition magazine blew up, only accelerating the process. For the Allies this first and brutal loss came as a total schock and surprise. Being totally unaware of the minefield the allies suspected a rogue submarine or a shell hitting ammunition.